As the trend is in latest expansions, we have yet another minion that supports the Healing/Control Paladin archetype. The card was revealed by PhenomenGames on YouTube. The video is in Russian. Paladin gets its own version of Hooked Reaver. It's not clear whether you need to restore Health on your hero or you can just heal any minion for this to work. A lot of cards have been printed in the latest expansions that promote this archetype of Paladin deck (even though Aggro Paladin always ends up winning) and maybe it is its time to shine. Other than that, Zandalari Troll Paladins are soon coming to World of Warcraft and it's good to see them in Hearthstone as well! 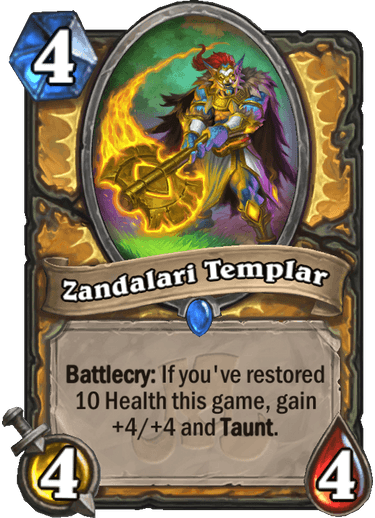 Let us know what you think about this card and don't forget to check out our Rastakhan's Rumble hub for everything you need to know about Hearthstone's upcoming expansion. Okay, hear me out here: People didn't know what to do about Crystalsmith Kangor last expansion, right? Well, I think this is what he were meant for. A healer Pala deck, with some focus on spells too, for the legendary. This could be really fun.